Double exposed on film. 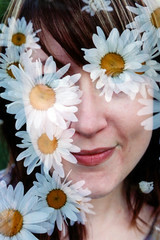 I tried to line up the daisies with her eyes, but they didn't line up exactly. I actually think it turned out better this way.